Welcome feathered friends with the serene sanctuary of this stoneware birdbath. Welcome feathered friends with the serene sanctuary of this stoneware birdbath. Decorated with a lily pad and blossom, the shallow pond-like dish is just the right depth for small birds to enjoy a refreshing dip or drink, while the textured bottom will give them something to grip while bathing. 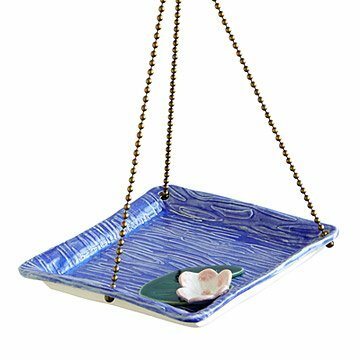 This glazed, weatherproof stoneware birdbath will provide an inviting avian sanctuary for years to come. Handmade by Jo-Anne and Gerald Warren in Canada. I bought this gift for my mother for her birthday. She loved it. It was very pretty. When they hung it up though and poured water into the bird bath, almost all the water came out of the holes used for hanging! Maybe we can figure a way to plug some of the holes to let more water sit in the dish. Hung it from shepherds' hook below window, near feeders, and it has already attracted wrens, sparrows. Bright touch.